Last week it was relatively calm in the combat zone. Russian occupation forces delivered precision fire on the defenders of Krymske, Prychepylivka, Mayorsk, Avdiyivka, Pisky, Krasnohorivka, Lebedinskyi, Pavlopil, Talakivka and Shyrokyne. Besides, the enemy used 82-mm mortars near Lebedinskyi and Talakivka. 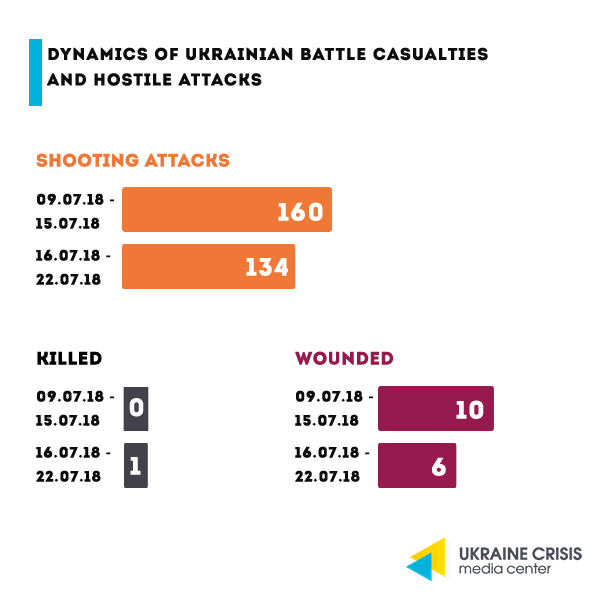 By their provocative actions the occupiers tried to force the troops of the Joint Forces to return fire in order to further accuse Ukraine of non-compliance with the declared truce. The world continues to review the results of the negotiations between Trump and Putin in Helsinki. So, former US president Barack Obama called for the preservation of democracy and warned about the growth of “policies of authoritarian rulers” without proving the name of Trump. Germany, in the person of Minister of Foreign Affairs Heiko Maas, called for further political rapprochement between Russia and the United States. And Prime Minister of Poland M. Morawiecki insists that the US leader has made no concessions to the issue of Ukraine at the Trump- Putin meeting. Having returned to Washington, Trump said that he had misspoke and agreed with the findings of the US intelligence services about Russia’s possible meddling in the 2016 US election. Reaction in the USA. Influential American journalist T. Friedman, analyzing the summit in Helsinki, writes that such behavior of the American president is so perverse that it is contrary to American interests and values. US Secretary of State Mike Pompeo said that US President Donald Trump took a tough stance on the Ukrainian issue at the meeting with Russian President Volodymyr Putin in Helsinki. “President Trump has made it clear to President Putin that Russia’s activities in Eastern Ukraine are not in Russia’s interests. The US administration has adopted a very rigid position on the Ukrainian issue,” Pompeo said. US Democratic Senator Gianni Shahin urged the interpreter of US President Donald Trump to testify in the Congress on a private meeting with Russian President V. Putin. Her initiative was supported by other Democrats. Senate Democratic Minority Leader Chuck Schumer proposed to immediately hold a hearing with all senior members of the delegation who were present at the meeting of US and Russian presidents. Some representatives of Republicans also supported such hearings. Meeting with the Minister of Defense of the Russian Federation. US Defense Secretary Jim Mattis is open to the possibility of the first talks since 2015 between the defense chiefs of the United States and Russia, Reuters reports citing two representatives of the American administration. The possibility of such talks surfaced after the controversial summit in Helsinki between U.S. President and Russian President. According to sources, Mattis is ready for talks with Russian colleague Sergei Shoigu. However, they have not specified whether it will be is a meeting or a telephone conversation. The Pentagon representatives declined comment, stressing that they had not received any official invitation from Moscow for talks. Trump on Russia’s interference in elections. After criticism from Republicans and Democrats, President Donald Trump said that he had misspoke, and actually agreed with the findings of the US intelligence services about Russia’s possible meddling in the 2016 US election. He stated this on his return to the United States after meeting with Volodymyr Putin, NYT reports. According to Trump, a misunderstanding allegedly resulted from a “double denial” used by him. Putin’s idea of ​​a referendum in Ukraine. 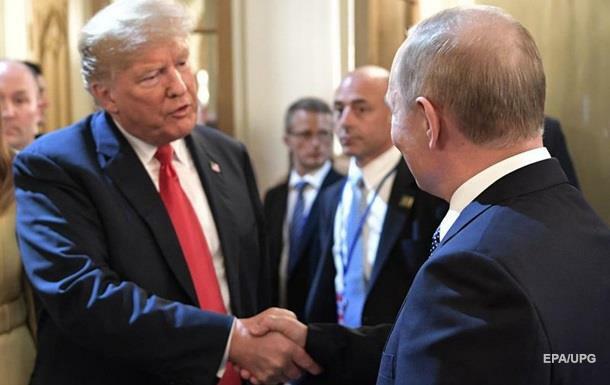 Bloomberg agency, referring to two sources, reports that Volodymyr Putin told Russian diplomats that at the summit in Helsinki he suggested that US President Donald Trump consider the idea of ​​a referendum that would help resolve the conflict in Eastern Ukraine. US State Department spokeswoman Heather Nauert reported that the US administration does not consider supporting a possible referendum in Eastern Ukraine. The head of the National Security Council Garrett Marquis also confirmed that Washington does not consider the issue of supporting a possible referendum in Donbas. Ukraine on the idea of a referendum. Foreign Minister of Ukraine Pavlo Klimkin stated that there are no prospects for the Kremlin’s idea of holding a referendum in the occupied territories of Donbas because people cannot express their will freely and honestly under occupation. “No one, literally no one believes in any possibility of expressing their will freely and honestly in Donbas under Russian occupation. As to political and legal aspects, everything is clear to everyone,” said Klimkin. Ukrainian high-ranking officials publicly called the investigation of Pavel Sheremet’s murder “a matter of honor,” but it is still unresolved. Over 2 years, the investigation has not gathered an evidential base in Sheremet’s murder case. Since the time of the murder, investigating officers have refused to disclose relevant information regarding the course of the investigation, which is conducted by a special group involving the FBI. There are 5 versions of the journalist’s murder: a crime related to professional activity in the territories of the Russian Federation and Belarus; an error in the object of crime, namely – it had to be an assassination of Olena Prytulya, owner of the Ukrayinska Pravda; professional activity related to his critical articles in the Ukrayinska Pravda and speeches on Radio Vesti; destabilization of the situation in the country, aimed at creating a false negative perception of the socio-political situation in Ukraine; conflict situations in Pavlo Sheremet’s personal life related to his family, commercial and financial state. But despite numerous inspections, interrogations of over 1,000 people, the removal of more than 150 terabytes video from surveillance cameras, there is currently no official suspect in Sheremet’s murder case. 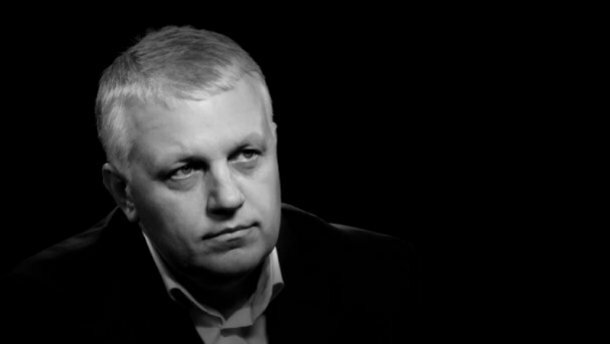 The Interior Ministry claims that Sheremet’s Russian citizenship makes the investigation more complicated. Sheremet died on July 20 at 7:45 am as a result of a car explosion. He was going to conduct his morning program. Pavlo Sheremet lived in Kyiv over the last five years, worked in the Ukrayinska Pravda, was a host of Radio Vesti. USA: Sanctions Bill. 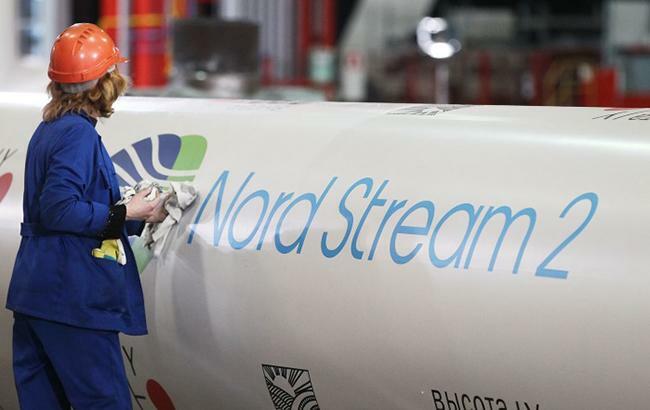 Republican Senator from Wyoming John Barrasso introduced in the US Congress a bill that mandates sanctions on the Nord Stream 2 gas pipeline, according to the politician’s website. The senator says that sanctions against the pipeline will give North Atlantic Treaty Organization (NATO) members an escape from Russia’s political coercion and manipulation. “Countries like Germany should be reducing the amount of natural gas that they buy from Russia, not increasing it,” Barrasso stated. Speaking in the Senate, he said that the initiative would boost the energy security of NATO members. Ukraine’s position: focus on the single European market. Foreign Minister of Ukraine Pavlo Klimkin stresses that Ukraine should become part of the single European gas market. “We have agreed with the European Commission on the principles of applying European energy rules in Ukraine. We must become part of the single European market, which will be the best guarantee for us and for the EU: we will proceed from common positions,” Klimkin wrote. Taras Kachka, Deputy Executive Director of the Renaissance Foundation, emphasizes that based on trilateral consultations between Ukraine, the EU and Russia on deliveries of Russian gas after 2020, held in Berlin on July 17, Ukraine will have to work hard to complete the integration of the Ukrainian market into the EU energy market, complete the reform of the gas market, eliminate negative aspects of the possible construction of the Nord Stream 2. Risks: delaying the transit issue. Andriy Kobolev, CEO of NJSC Naftogaz of Ukraine, fears that the Russian party will do everything to delay negotiations on the extension of the contract for transit of Russian gas through Ukraine, waiting for possible changes in the country’s government and its political course. In a comment to Interfax-Ukraine, he said: “They are most likely waiting for elections (in Ukraine – Ed.) and want to see if there is any change in power and political course. And they will do their best to start the construction of the Nord Stream 2,” he said. 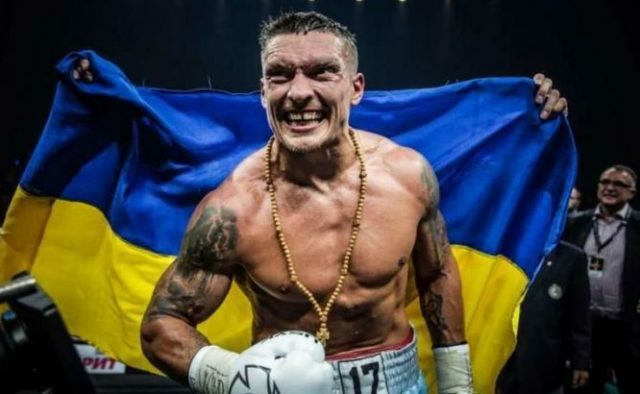 Ukrainian boxer Oleksandr Usyk defeated Russian Murat Gassiev in the World Boxing Super Series final. 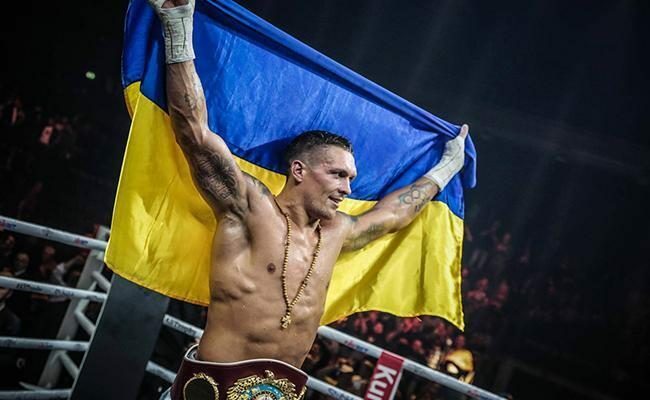 He is the first Ukrainian absolute world cruiserweight champion. The battle took place in Moscow at the Olympiyskiy Stadium. It was to be held on May 11 in Saudi Arabia, but was postponed due to the Ukrainian’s injury. Later it became known that Moscow will host the super series. The professional World Boxing Super Series tournament was held for the first time – it was founded in 2017.